Rather a long time ago now, early in the 1990s, walking along the ridge of a hill in Berkshire, I more or less stumbled across Ashdown House, that famous collision of classicised architecture with historical melodrama, now owned by the National Trust, some of the contents of which will be auctioned by Sotheby’s in London in a couple of weeks’ time. At this distance the context is hard to recapture. Looking at the online map today in the hope of reconstructing that journey, I suppose we must have been walking from Ashbury to Lambourn. Certainly, I remember climbing up to see the bell tower of Lambourn’s ancient parish church, assisted in this project by a similarly ancient sexton seemingly on leave from a Thomas Hardy novel. Reconstructing further, I suspect the reason we were in the area in the first place was to visit the White Horse of Uffington, Wayland’s Smithy and other prehistoric sites. The Berkshire Downs are, after all, a part of England at once casually beautiful and imaginatively liberating. One gets the sense that man and nature have operated there for so long together, working in such close proximity, that the boundaries which elsewhere separate their legacies start to blur a little. It’s an enchanted landscape. In any event, I certainly shan’t forget the shock of rounding a bend onto the top of that chalk ridge and then seeing — with all the weird emphasis of an hallucination — the tall trim cupola, detached flanking pavilions and formal parterres of Ashdown House laid out in the valley below me. What could this apparition possibly mean? 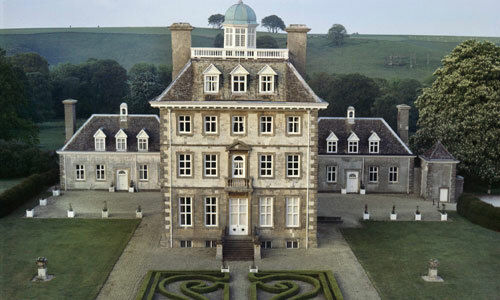 The conventional thing to say about Ashdown House is that it looks like a dolls’ house — a comparison made by Pevsner, amongst others. Yet this hardly does justice to the force of its formidable strangeness. Apparently built by the Dutch-born architect Capt. William Winde in the mid 1660s for William, the first Earl of Craven — although as Winde would only have been in his early 20s at the time, some question the attribution — the structure, although fashioned in part out of the local chalk, recalls seventeenth century Dutch architecture at its most aridly Francophile, with the influence of François Mansart particularly evident. It also has an unreal, impermanent air, as if it has just dropped down out of the sky and indeed might wish to return there at any moment. What is certainly doesn’t look much like, on the other hand, is a normal house, of the sort in which actual people might plausibly live. To me, in fact, Ashdown House it looks less like a dolls’ house — can anyone really imagine a pair of sticky childish hands coaxing open that façade? — than like a very grand lady’s casket of the sort that Lord Craven, tireless servant of his tragic Winter Queen, would have known all too well: expensive, highly ornamental, easily portable yet potentially full of treasure, too. As mentioned, later this month, on Wednesday 27 October, a selection of the treasure accumulated within Ashdown House will go on sale in London. This follows on from the fact that the house itself has recently changed hands. Last year, however, Mr and Mrs Ulfane — who also own a house near Regent’s Park, a village in Tuscany and several other properties further afield — decided to move on, selling both their leasehold interest in Ashdwon House and freehold property adjoining it. Accordingly, the 41-year lease remaining on the property was advertised for sale at £4.5 million. After some interest from Anish Kapoor, amongst others, it appears that the National Trust’s new tenant is to be Pete Townshend, a musician whose professed enthusiasm for Gustav Metzger‘s concept of auto-destructive art — or in plain English, smashing stuff up — may, one hopes, diminished at least a little with the passing of the years. Mr and Mrs Ulfane, at least, took their role as temporary custodians of Ashdown house very seriously. In the grounds, on the site of a derelict stable which they owned in freehold, they erected c. 1990-91 a Philip Jebb-designed neo-Palladian Orangery complex enclosing a swimming pool. With the assistance of interior designers David Mlinaric and Hugh Henry, they have also worked hard to furnish the private rooms of Ashdown House with items well-suited to the style of the building and, where possible, relevant to its history as well. The sales in 1968 and 1984 of important Craven family pictures were particularly relevant here, supplemented with purchases from Robert Kime, Chris Gibbs, Cianimino, Sir Guy Holland, the usual upmarket art fairs and auction houses. The items on sale at Sotheby’s this month are, if I understand the catalogue correctly, the fruits of this effort. Many of the items are, in their various ways, rather wonderful. These include a pair of massive Delft pyramid flower vases, a pleasant old William and Mary ebonized mirror, a bust of Charles I attributed to the circle of Michael Rysbrack, and a still-life by Abraham Brueghel the insane superabundance of which is nicely balanced by the austere concentration of Pieter Gerritsz van Roestraeten’s painting of a few pieces of export china. All of these will, one supposes, find their already considerable value boosted by the association with such a handsome house, filled so so many marvellous things. Greatest of all, though, at least in their emotional impact, are the pictures most closely associated with the Winter Queen, her family and friends. These include paintings by Gerrit von Honthorst, Van Dyck’s studio and circle, a self-portrait by Louise Hollandine, Princess Palatine, and a strange painting by Lely which might or might not depict Elizabeth of Bohemia crowning the first Earl of Craven with a wreath, as three cherubs go on. Before I go further, I should note right away that the Ulfanes, having acquired all these items, are entirely within their rights to sell them again, just as Sotheby’s — its country house sales department presumably flushed with the manifest triumph of the recent Chatsworth Attic Sale — is justified in auctioning them. Good luck to all concerned, I guess. Yet when the catalogue for the Ashdown House sale arrived in the post — and a gorgeous thing it is, too — I found it hard to suppress a degree of — what? Sadness, I suppose, is possibly the best word for it, although not unmixed with a degree of bemusement too. Part of the sadness, no doubt, arises organically out of the sweet, sad, infinitely romantic story of Ashdown House itself. As mentioned previously, Ashdown House was built in the mid 1660s for William, the first Earl of Craven (1608-1697). The son of an immensely wealthy financier, Craven ran away from university to join the army of Maurice of Nassau, Prince of Orange, an impetuous act which set him off on a career of military endeavour, royal service and, in particular, literally obsessive devotion to the cause of Frederick V (1596–1632), the Elector Palatine and of his wife, Elizabeth of Bohemia (1596-1662), James I’s daughter and Charles I’s sister, the Winter Queen of royalist myth and memory. Without devoting another few thousand words to the subject to the subject — and don’t worry, I shan’t — it is hard to emphasise sufficiently the extent to which Craven threw everything he could — wealth, physical bravery, personal credibility — in his efforts to wrest the Palatinate back from the Emperor Ferdinand II. In doing so, he managed to evolve for himself a highly personal cult, centred on self-sacrificial devotion to a woman, from the very iron-clad heart of the thoroughly militant protestantism that in turn constituted one of the great ideological causes of the age. Indeed, one struggles for the sort of semi-contemporary parallels that would make such a struggle seem real — how about the efforts of a certain sort of compulsive 1980s Cold Warrior, perhaps, bankrolling the Freedom Association or the ISHR, sneaking fax machines under the trailing hem of the Iron Curtain whilst simultaneously asserting the claims of Mangosuthu Buthelezi and Joans Savimbi and consuming South African grapes in the most conspicuous manner possible? Yet this hardly captures the pathos of Craven’s experience. No, one would have to add to it a vignette of, say, Gerald Howarth MP squiring Lady Thatcher from place to place after her fall from power — protective yet infinitely deferential towards this increasing frail vessel in which the hopes, fears and fancies of an entire era are somehow still contained. Craven, at any rate, would remain faithful to his cause as long as it remained humanly possible to do so. From 1642 onwards, Craven stayed with Elizabeth’s increasingly theadbare retinue at the Hague, paying her bills and personally contributing an astonishing £50,000 to the exiled monarchy and its supporters during the darkest years of the Interregnum — this, despite the fact that the wretched Parliamentarians not only sequestered his estates but did their best to destroy their value, hacking down trees, letting houses fall to ruin and so forth. Following the Restoration, and despite his diminished fortunes, Craven’s support for Elizabeth was unremittingly practical as ever. In 1661, when it became clear that Charles II felt no great urgency in organising a London home for his aged aunt, Craven invited her to move into his house in Drury Lane, where she lived until a few weeks before her death from sort of respiratory illness on 23 February 1662. And although she very clearly didn’t live long enough to see it, the story persists that Ashdown House was built by Craven as a country house for his beloved lady — an indescribably elegant, rather feminine, patently Dutch-inspired reliquary in which to place the focus of his life’s devotions. To this day, it remains defined, to those who know its story, precisely by what it never in fact contained. Craven, who inherited Elizabeth’s pictures, papers and possibly some of the menagerie of dogs and monkeys with which the Electoress habitually surrounded herself, never married. He remained close to other members of Elizabeth’s rather turbulent and various family, notably her daughter Sophie, helping them in whatever way he could. Of course there were also other aspects to his long life, some of them downright Wellingtonian — further military posts, responsibility for putting down various London riots and for organising mass burials during the plague of 1665, roles in colonial administration — which, if we had more time, would deserve discussion, too. What, though, did Elizabeth’s family make of their loyal servant? As his much-admired Sophie put it, Craven ‘n’a pas trop le sens commun‘, was often silly and sometimes worryingly eccentric. With the so-called Glorious Revolution, of course, came what was perhaps the ultimate test of his loyalty. So there’s irony in the fact that James II apparently had to dissuade him from mounting a final defence of London against the Prince of Orange — as the DNB puts it, ‘the one British monarch of the seventeenth century who fully shared [Craven’s] commitment to the military defence of European protestantism’. Personally, though, I warm to him enormously. Isn’t it astonishing that no one seems to have written a book about him recently? Well, perhaps not so astonishing — and here, perhaps, we approach from another angle the whole issue of why the Ashdown House sale filled me with such regret. Is there anyone out there these days who cares much about the more unfortunate Stuarts, their travails and tribulations? In contrast, once upon a time, not so long ago, a romantic attachment to the Stuart cause could be taken for granted amongst a certain sort of educated or at any rate sensitive person. To the author of The Englishman’s Room, for instance, it presumably came as no surprise to hear Sir Hardy Amies referring to the Winter Queen as ‘my favourite lady in history’, to see that he kept a portrait of her on the wall of his drawing room at Langford or that another wall of that house was decorated with stags’ heads which the designer hoped and believed had once belonged to her — after all, Avilde Lees-Milne’s own husband, James Lees-Milne, wrote The Last Stuarts (1984), a study of the various Stuart pretenders of the eighteenth century, more as a labour of genuine love than as a commercial proposition. Examples could be multiplies, but for the moment, these will have to do. Such people would, I imagine, have gone positively mad with acquisitive fervour at the mere idea of an Ashdown House sale, particularly one including so many family portraits. Well, they were all the sorts of people who loved discussing, buying and displaying such things. In a slightly different world, however, they might have taken time off from beautifying their own houses and gardens just long enough to have suggested that items with such a strong association with Ashdown House might best be retained within the collection there, enhancing not only the period style of the place but also simultaneously strengthening its claims as a sort of secular shrine to the Stuarts and all that they are supposed, rightly or wrongly, to represent. And, whatever my own ambivalences about the National Trust (see here), they’d at least have had a point. Yet as Simon Watney shrewdly observed in his comment on another post here — and here I should like to thank him for encouraging, however inadvertently, my own suspicion that there was something more to be said about this sale than what the copy-writers at Country Life et al had said already — while it is easy enough to imagine the media clamour that would surely have ensued had relics of England’s republican past been threatened with dispersal, where’s the campaign to save a collection with Stuart associations? The problem with the Stuarts, I suppose, is that in a sense they represent precisely the sorts of things from which the current management of the National Trust wish to distance their organisation — respect for authority, elite pleasures, social and political conservatism, history as a top-down enterprise — the very qualities, in short, which proponents of the Stuarts tend rather to admire. No, the Stuarts remain cloaked for all eternity in the satins, brocades, gleaming armour and superabundances of lace in which Van Dyck and Lely depicted them. Try though it might, popular culture can find in them neither the meritocratic brutality of the Tudors nor the bumbling domesticity of the Hanoverians. As a society, we struggle to derive any useful moral from their existence. Hence our public bodies largely ignore them. So when an exhibition like The King’s Blood: Relics of King Charles I appears in London, as it did in the run-up to last Oak Apple day, it’s inevitable that the exhibition hosting it should be a commercial enterprise — albeit a charitable one too, as Wartski donated proceeds from sales of the excellent catalogue to the Down’s Syndrome Association — rather than a public collection, and equally inevitable that when one encounters a truly goosebump-inducing Royalist relic, it’s as often in the salerooms as anywhere else. As a devotee to the memory of the first Earl of Strafford, for instance, one of the minor regrets of my life is that I didn’t manage to acquire this when it came up for auction in 2008, but at least I’d the chance to handle several of the items in the Wartski show when they turned up at auction over the past decade or so. The National Portrait Gallery did, admittedly, stage an exhibition of Stuart portraits in 2001-02, but in titling it Painted Ladies: Women at the Court of Charles II they did nothing to detract from our collective conviction that the world of the Stuarts was frivolous, amoral where it wasn’t simply wicked, in short alien and unsympathetic. Rather better was Tate Britain’s Van Dyck and Britain in 2009, an art-historical exhibition that ended up being hijacked, at least for a few of us, by the sly fascination of its subject-matter. In general, though, the most rewarding physical context in which to encounter the Stuarts and their world remains the buildings in which they lived, worked and worshipped. And here we return again to Ashdown House. Since its acquisition by the National Trust in 1956, much effort has been taken to restore it to a state which is at least intended to recall its mid-to-late seventeenth century character. The National Trust saw fit to remove, for instance, the nineteenth century screens which had created wings out of the little pavillions flanking the main house — which, given that Airey Neave had lived in one of these wings just after the war, with hindsight might be considered a somewhat questionable decision. The heavy Victorian box parterres were grubbed up and replaced with the current version, which was felt at the time to be much more in keeping with the house’s late seventeenth century ambience. The main structure itself came to the Trust as a battered, beautiful but almost entirely empty box. The principal glory of the building’s interior, the wide and elegant stairway running up the centre of the cube, remained intact, but what else was there? Not much, it seems. Following the sale of Coombe Abbey in 1923 — it is now a hotel — whatever inherited family treasures the Cravens possessed had, I think, migrated with them to Hawkwood House in East Sussex. No, for better or for worse, as of 1956 Ashdown House was simply never going to constitute some sort of ‘time capsule’, evoking with rough-edged authenticity either its true Stuart origins or those subsequent generations of family occupation. There simply wasn’t enough left. Hence it was always going to require re-imagining, creative projection, the substitution of something else worth seeing for all that had been lost — either that, or remain permanently a particularly literal monument to failure and loss. This, in turn, is where a new character enters the story. Turning the pages of the catalogue for the forthcoming Sotheby’s sale — something well worth doing, incidentally, for as was also the case with the Chatsworth Attic Sale catalogue, the quality of the photography and production really couldn’t be much better — one didn’t have to be an interior design obsessive to identify in the colour, contents and arrangement of the rooms depicted the guiding intelligence of David Mlinaric. It was there, obvious as a signature, in virtually every photo. From the expensively luscious fresh flowers to the elaborate pelmets, the conjunction of trophy objets d’art with comfy sofas upholstered in practical fabrics, splashy rugs and ornate cushions, an intuitive and sometimes inspired deployment of colour, the relaxed assimilation of new and old, the unmistakable air of ‘shabby chic’ executed on a multi-million pound budget by a first-class interior designer — who else could have done all this? For even if one didn’t happen to know Mlinaric’s name, in fact, pretty much anyone could, I think, have eventually fathomed that what was on show in Ashdown House was an extended bravura essay in a particular sense of style which is to our own times what the style of the late John Fowler was to the decades following the Second World War — which is to say, the style which percolated down through country houses and public spaces, through the influence of illustrated magazines and open days as much as that of personal networks, until it came to evoke its own era as clearly as specifically as some half-heard blast of the music of the time, a collection of newspaper headlines or celebrity photographs, a whiff of some once-popular scent that isn’t made any more. Yet as lapidary, even authoritative as such things may somehow seem, they are also infinitely fragile. We can see this in the case of John Fowler’s legacy. If distance now allows us to look more critically at Fowler’s contribution to interior design in general, and the evolution of ‘country house style’ in particular — Patrick Baty‘s generous yet sharp-eyed essay here, for instance, re-evaluating Fowler’s writing on colour, ought to be required reading for anyone interested in these matters — it also enhances our appreciation of Fowler’s enormous influence on the visual culture of the post-war Anglophone world. From the rarefied interiors of major National Trust properties to intensely ordinary suburban bungalows in the American Midwest ‘done up’ by earnest students of House & Garden, Fowler cast a long shadow. We can, clearly, still gauge his importance through fairly direct tributes such as John Cornforth’s The Inspiration of the Past: Country House Taste in the Twentieth Century (1985) — the prose so vivid as to compensate, almost, for the relative paucity of colour illustration — just as we can, if we listen closely enough, catch something in James Lees-Milne’s tone that suggests, however delicately, that JLM occasionally had cause, towards the end of his long life, to regret the wholesale Fowlerisation of the National Trust’s properties that came about as a result of his old friend’s influence. Yet what we cannot do — or certainly, cannot do easily — is to experience these rooms for ourselves at first hand. How many complete, unmodernised, unadulterated Fowler interiors survive these days? I’ve been worrying about this for a while now, and my conclusion is largely negative. On one hand, when it comes to private interiors, taste has quite understandably moved on, so that interiors which were once at the cutting edge of elegance soon came to look a bit fusty and Queen Mother-ish, whilst not appearing in any valuable or admirable way ‘historic’. On the other hand, where Fowler had worked, as he did in so many National Trust properties, to produce what he believed to be wholly sympathetic and practical if not exactly accurate evocations of period interiors, curatorial and presentational strategies have also moved on, often with a profound impact on the decoration of the rooms in question. We are in danger of losing, in short, our most immediate links with a particular strand of historically-informed style which, for several decades, exerted the most profound effect on the contemporary design strategies of the time, too. Or to try to put this slightly recondite point yet another way, what the 1950s thought about the 1660s is, in some sense, as interesting as whatever it is that we think we know about the 1660s per se. But let us now emerge from this apparently eccentric, distinctly swirly editorial parterre and turn our attention back towards Ashdown House, which is where, appearances notwithstanding, we’ve been headed all the time. For now I had better confess that when I first handled that Sotheby’s catalogue, my sadness was not simply prompted by the idea that so many items with such close associations to the romantic story of the Winter Queen and William Craven — items painstakingly acquired over decades, an exercise requiring not only quite a lot of money but also judgement, expert advice and probably a degree of serendipity — should now be dispersed to the winds, rather than remaining within a context that suited them so perfectly, both aesthetically and historically. My sadness also stemmed from the fact that the carefully-calibrated spaces depicted with such care in that catalogue — not just the public ones either, such as the great stairway, but also that drawing room, dining room, bedrooms and so forth — were going to be broken up, and thence that an absolutely exquisite, unspoiled and unrepeatable series of period spaces — that period, incidentally, being the 1980s and 90s — will soon be lost forever. Let me now bat away a few of the more obvious objections to this line of reasoning. First, yes, I do realise that practically none of the rooms depicted in the catalogue were in fact open to the public, even during the relatively tiny window of time in which visitors are admitted to Ashdown House. Not least, the Trust’s own website entry is hilariously discouraging when it comes to advertising the property’s limitations as a tourist destination: ‘No WC. The house is tenanted. Access limited to the staircase and roof (100 steps)’ — and that only on Wednesdays and Saturdays, April until October, 2-5 pm. The Trust’s ‘facilities’ page is particularly poignant in this respect. So for the visiting punter, there wasn’t exactly an over-lavish helping of top-quality Mlinaric action on view. Further, let me note that in order to make the argument to work, it is not compulsory — not even all that helpful, really — that the person articulating it should be some card-carrying, fully paid up member of the Mlinaric fan-club. Personally, while I find much to admire in his interiors, and indeed have doubtless internalised far more of his conventions than I could even begin to realised at a conscious level, there is always something a little too ‘done up’ and hence cold-blooded about them. Admittedly, this may be a trick of the way they are conventionally photographed. Is it possible that the hampers of Lego are once again spread out across the Mahal carpet, the unglamorous shopping once again heaped in bags at the door, the miscellaneous postcards, invitations, children’s scribbles and incredibly embarrassing photos blue-tacked onto the marble overmantle the moment Derry Moore and his cameras are safely off the premises? Finally, for those with reservations regarding the whole raison d’etre of the National Trust — well, I have reservations too, adumbrated here. But now that it exists, and since it is likely to continue to exist for some time, one might as well expect it to do more or less the sort of thing that it was set up to do. Here, then, is the serious point. In the years that have passed since 1984, Mr and Mrs Ulfane have taken an architecturally fascinating, strikingly sited, historically significant yet largely empty building and transformed it. They have done so using an enormous amount of money, high quality professional advice from Mr Mlinaric and others, excellent contacts within the antiques trade and auction houses, formidable organisational skill, good luck, imagination, an attractive blend of historical sympathy and present-tense confidence, and — perhaps most importantly — a sense of style which already seems to tell us something we’d half forgotten about the increasingly distant world of post-Big Bang, pre-slump opulence, that brief moment in which Thatcherite-era wealth could stop striving and simply relax in its own neo-Palladian orangery, what once could pass for the End of History yet now reveals itself as a short-lived interlude which — whatever one thinks of it, whether one hated or loved it — is now firmly past, as much so as the ages that first produced the White Horse of Uffington or Wayland’s Smithy, with all the obligations for preservation, conservation and curatorial ingenuity that inevitably ought to imply. Yet now it’s going to be lost — and the National Trust doesn’t care. At present, as it happens, the management and membership of the National Trust are engaged in one of those battles for the organisation’s soul which seem to take place every decade or so these days. The immediate cause of the present discontents is a rather technical point about the proportion of members who have to vote in favour of calling an Emergency General Meeting in order for such a meeting to take place — the management want to raise the current 0.25 threshold to 1 percent — but the as usual, this turns out to be only the showy tip of a very hefty, potentially damaging iceberg of discontent. Complaints include the introduction of a new lower-case logo and the decision (a la Tate) to jettison the definite article in the organisation’s name, plans to ‘bring the countryside alive’ through the introduction of motorbike trails, barbecue facilities and surfing competitions, the creation of semi-detached campaigns that seem to have little to do with the organisation’s purpose, and — although this is an ongoing grievance — the ‘Disneyfication’ of historic houses, complete with costumed reenactors and audience participation. What is the National Trust for? I shall not apologise for asking this question rather frequently for, in truth, the more closely one looks, the harder it is to know. Does it exist to sell boots, promote various green agendas, to maintain a shrine to the memory of a terrorist sympathiser hardly under-commemorated elsewhere? Is it about preventing ordinary people from building scruffy holiday homes on beautiful beaches, about subsidising the maintenance of aristocratic homes whilst propagating pleasing myths — romantic, voyeuristic, politically correct, populist, the list is a long one — about what once went on within them? Or is it about institutional self-preservation, where what matters is the largest possible membership roll, the greatest revenues, hence the widest ‘relevance’? At present the National Trust is all of these things, to one degree or other, as well as a sort of Fight Club for amateur heritage enthusiasts. There is a sense in which the fate of Ashdown House reflects these dilemmas. Having leased out Ashdown House, at least in part because there was initially so little to be seen in most of its panelled rooms, the National Trust now, more by accident than design, finds itself in a situation where those once-empty rooms are now replete with interest, even beauty — beauty of a distinctive yet fragile sort that looks back at the 1660s through the subtly-tinted lens of the 1980s subjective good taste and historical selectivity, somehow illuminating all these thing. Yet the National Trust, our greatest and best-endowed of heritage bodies, is either unwilling or unable to make even the slightest effort to preserve what has been created here. What, I ask again — this time the rhetorical tone has switched from bemusement to something more like actual indignation — is the National Trust for? In closing, I should finally admit that I have no idea why Mr and Mrs Ulfane have decided to leave Ashdown House, or indeed how they feel about doing so. In the current issue of World of Interiors — a publication which seems to enjoy a particularly amicable relationship with the Sotheby’s country house sales team — an unnamed offspring of Mr and Mrs Ulfane recalls weekends spent in the house, often lurking in the Orangery to avoid the disruptive presence of National Trust visitors. The article is well-written — there’s much less of the feeling of something ghost-written by some hard-pressed sub than is often the case in these efforts — but almost painfully elegiac in tone. Oddly, the reader ends up sharing something of this sad sense of lost inheritance. Well, the financial climate is chilly for almost everyone these days. It would be too much, I think, to have asked that Mr and Mrs Ulfane might simply have contributed their creation to the National Trust, in the hopes of preserving what they have achieved, perhaps even of affixing their own names in perpetuity to the roll of those who have offered up what they had, for better or worse, in what they believed were the interests of augmenting our collective understanding of Britain’s visual heritage. But surely it is not too much to ask that the National Trust might at least have considered preserving these rooms — imposing a few more conditions on the new tenant (or indeed buying in the remainder of the lease), opening more of the rooms to public more often, maybe even making a feature of their blend of near-contemporary significance with extended historical memory? Soon, though, Ashdown House will revert to being what it was before — a startling apparition amongst the green Berkshire hills, as it always has been, but also a perpetual cenotaph, a doomed sort of place, more remarkable for its absences than its presences. And if I ever have cause to stumble across it again, my reaction will be less one of delighted curiosity, as it was before, than one of not-quite-resigned sadness. Having viewed the impending Sothebys sale today and seen the intriguing and rather curious World of Interiors article I have many shared thoughts. Such a waste of the Ulfanes dedicated and well-considered endeavours, and a sad dispersal of an interesting pooling of Craven pictures. Did the National Trust have no interest in the preservation of the whole? Thanks for the comment — how interesting that you found that World of Interiors piece ‘rather curious’ too. It would be fascinating to know whether the National Trust made any attempt to acquire and retain either the Craven pictures, or indeed the present contents and decorative scheme of Ashdown House more generally. As mentioned above, one can’t help thinking that if the pictures concerned had radical republican associations, rather than royalist Stuart ones, the Trust would certainly have gone into ‘save our nation’s heritage’ mode regarding them. All I can say for certain, though, is that I’ve seen no evidence that the Trust tried to preserve any of this — which, given that the Trust exists to ‘protect special places’, rather than e.g. acting as an upmarket property leasing company, is disappointing. Meanwhile, on a related note, here’s a relevant piece on the current state of the National Trust from this weekend’s Sunday Telegraph. It is indeed sad when beautiful things which “give the very form and pressure of the age” vanish with that age: even more if they are restored beautifully in a later age – only for that restoration to vanish in turn, along with its own age. That single act by “the merry monarch” was legacy enough for ten kings: a solid foundation for our familiar rational modern world. Let alone his courageous facing down of Cromwell’s ayatollahs, which set the English speaking peoples on their long walk to freedom from the dreary shackles of puritan oppression. i too was intrigued enough by the ‘rather curious’ article in WoI to attempt to learn more about ashdown house, which led me to this site. especially the portraits– once an enlivening part of the historical atmosphere of the house– should be seen to be victims in in the break-up of its furnishings. seems they would be rather meaningless elsewhere, discrete bits scattered far and wide.